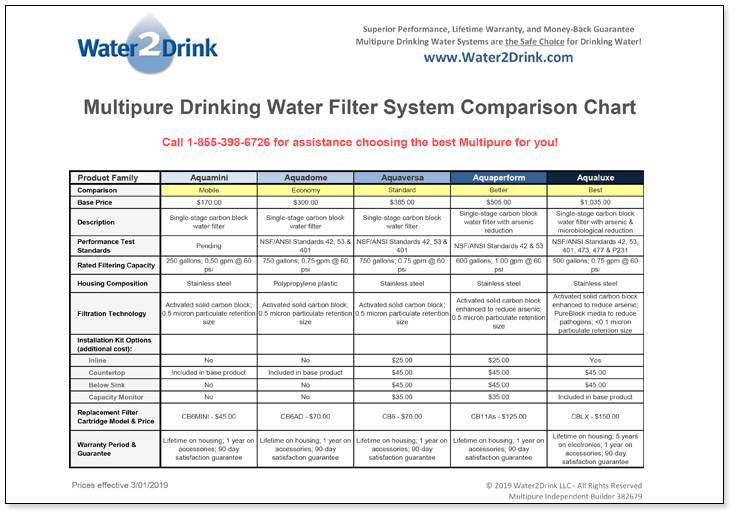 The Multipure Aquaperform Inline model is one of the most technologically advanced water treatment devices available, providing the BEST in performance – reduces all of the contaminants that the other Multipure Drinking Water Systems do, PLUS ARSENIC! The Multipure Aquaperform Inline model is a highly effective drinking water filtration system that installs inline and provides convenient access to fresh, clean drinking water whenever you want it. The Aquaperform Inline is designed to be installed under the counter and used for inline applications such as for icemakers, hot water dispensers, water fountains, coffee machines, various restaurant uses, and more. The versatile filtration unit housing can be mounted out of sight on the cabinet wall, or set on the cabinet floor using an optional plastic base (not included), and it ships to you with a mounting bracket for attaching the housing to a cabinet wall. This filter system previously was identified as Multipure model MP880SI.